I recently saw a useful distinction between AI – artificial intelligence, which is machines replacing people – and IA – intelligent assistance, which is machines helping people. Real Magnet, an email service provider turned marketing automation vendor with over 1,000 clients, doesn’t position itself as either. But its flagship feature is letting marketers create sophisticated, multi-step campaigns by answering handful of questions in a template. The remaining work to implement the marketers’ choices is done by the system. That sounds like Intelligent Assistance to me. This piques my interest because I’ve long argued that the chief roadblock to wider use of marketing automation is the difficulty of setting up campaigns, and have offered Artificial Intelligence as the solution. That is, I have been looking for systems that automatically design campaigns (or deliver optimal customer treatments without campaigns), thereby removing the roadblock by doing the work on the marketers' behalf. This has always felt a bit optimistic, but, then, so do self-driving cars. An Intelligence Assistance approach seems like a more plausible near-term alternative – analogous to the “driver assist” features already finding their way into automobiles. Of course, many marketing automation systems use templates as part of their campaign set-up. What sets Real Magnet apart is the entire set-up is done through the templates. The system does offer a conventional workflow builder (which is quite nice, in fact) but it's not needed for campaigns that fit the standard templates. Users do have the ability to convert template campaigns to the workflow format for customization. .
To make things a bit more concrete: the Real Magnet campaign picker starts out by asking the user to select their industry from a list. The system then presents a choice of industry-appropriate campaign types such as subscription renewals, webinar promotions, birthday and anniversary messages, and welcome kits. Once a campaign is chosen, the system presents three or four steps with a few questions per step: for example, steps for a standard email campaign are select the audience, select the messages and intervals, and schedule the execution. Most of these selections are themselves made by picking from predefined options or templates, with the ability for users to set up new options as needed. Real Magnet support staff is also available to set up options when clients need help. Campaign templates can include multiple steps and branching flows, such as follow-up messages to people don’t complete a registration process. 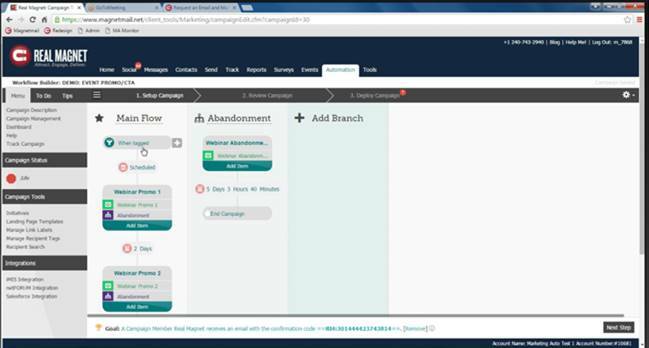 Campaign steps can include many types of actions, from sending messages to assigning group membership, setting field values, managing point totals, suppressing further communications, or directing the flow to another branch or block within a branch. Over-all, these options make Real Magnet a very powerful system. Campaigns can also run processes such as a/b tests, lead scoring, landing pages, segmentation, or suppression lists. In other words, pretty much any task that would ordinarily require complex set-up can be created through a template. Not surprisingly, Real Magnet reports its users – typically small marketing departments with limited resources – find this very appealing. Those are exactly the kinds of users who struggle to deploy advanced features in most marketing automation systems. 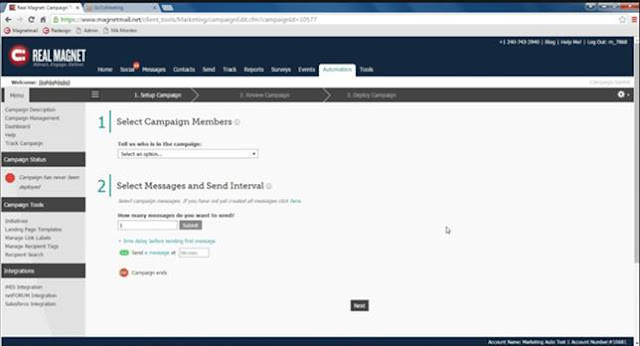 Real Magnet also provides several levels of campaign reporting, from a dashboard with summary statistics to performance by individual messages within a campaign to lists of campaign participants. Reports vary based on the campaign details. They often include engagement rates and achievement of user-specified goals. Reports can also consolidate results for groups of campaigns. The Real Magnet database is largely limited to a single record per customer, although the system does track promotion history and related events such as form files and survey completions. Users can add custom fields to the customer record but not custom tables. The system integrates with major CRM and association management systems, and can access their contents to some degree. It also stores social media handles for Facebook and Twitter, can send messages through those systems, and can create scores based on social media behaviors such as retweets and likes. Real Magnet started business in 2000 as an email service provider. More than half of the company's 1000-plus clients are trade and professional associations, with additional concentrations in education and publishing. Pricing of the Real Magnet system is based on number of emails sent. Packages start around $200 to $300 per month. My look last week at True Influence’s InsightBASE, a relatively new-fangled approach to intent data, was karmically balanced by a conversation with Avention, a old-line data aggregator that traces its roots to CD-ROM business lists from Lotus OneSource. The folks at Avention had reached out to discuss their latest product, DataVision, which extends Avention’s reach from sales enablement to marketing systems. The goal is giving clients a single data source to support both departments. DataVision lets clients upload customer lists to be cleaned and enhanced by matching against Avention’s own master file, which is itself compiled from some seventy sources. Sales and marketing systems can then access the results in an online database, providing all departments with a single, consistent view of their consolidated data. The information includes both companies and contacts and supplements standard profile information with event-based "signals" derived from news reports, company Web sites, and social media postings. Clients can set up alerts based on signals and can acquire new names that are similar to their current customers. If this sounds familiar, it’s because Reachforce, InsideView, SalesLoft and other data vendors offer similar services. Predictive modeling vendors including Leadspace, Lattice Engines, Mintigo, and Everstring also provide enhancement and signal-based alerts, although usually with less depth of detail. The biggest difference is those vendors usually send the enhanced information back to client systems rather than keeping it in an external database which sales and marketing systems access directly. But different isn’t necessarily better. No one will discard their CRM or marketing automation database and use the DataVision file instead. There’s simply too much other information within the sales and marketing systems. So, in practice, DataVision will be used to update a company’s existing databases, pretty much the same as its competitors. The data may be a bit fresher, since any query to DataVision will return the latest information available to Avention. DataVision also provides some nice tools to visualize the distribution of a client’s customers across geography, industry, company size, and other dimensions, and to compare those distributions with the entire Avention universe of known firms. Again, these features are useful even if they are not necessarily unique. In short, Avention DataVision is a solid option when you’re looking to clean and enhance your company’s customer and prospect data – something every firm needs to do. Intent data and predictive modeling are not part of the mix yet, but it’s easy to imagine those being added in the future. Whether Avention is your best choice will depend on your specific situation. The only way to know is to define your exact requirements, test several sources, and evaluate the results. The good news is you have lots of vendors to choose from, so you have a good chance of finding one that fits your needs. Intent data is one of hottest topics in marketing today – see, for example, Oracle’s recent purchase of AddThis. But while the promise of intent data is irresistible – “reach prospects with demonstrated interest in your product!” – the reality has been less appealing. Even setting aside issues of accuracy and coverage, there are problems with both advertising and email, the two primary applications for intent data. Advertising can reach large numbers of people but just a tiny fraction will click on an ad and a tiny fraction of those will provide contact information. Intent-based email lists are obviously contactable but volumes are often quite low. B2B lead generation vendor True Influence today announced a new product to help fill these gaps. InsightBASE monitors intent signals – in the form of visits to Web pages with relevant content – and notifies clients when there is surge in activity for companies on a target list. The notifications can be loaded as lists into a marketing automation or CRM system, where they can trigger advertising, sales calls, or other actions. Clients also receive contact names, email addresses, and phone numbers at those companies. The contact data is drawn from True Influence’s master list of 30 million business contacts, which are continuously verified to ensure deliverability. Although the names are not tied directly to Web visits, they are selected by job title and level, so they should be appropriate. Visits are tied to companies based on the user’s Web domain – a typical approach although one that can’t misses many sessions from home offices and mobile devices. So, what distinguishes InsightBASE from other intent-based products? The main difference is that users get the company and contact lists. This contrasts with many intent-based advertising vendors, who serve ads to qualified audiences but don't tell clients exactly whom they’re reaching. InsightBASE also differs from predictive marketing vendors who use intent data as inputs to their scoring systems and in some cases also provide lead lists: although predictive models almost surely do a better job of isolating the best prospects than InsightBASE’s simple profiles plus surge tracking, the models add considerable cost and complexity. True Influence also says its partner network gives it access to more intent data than anyone else. That's possible but I haven’t done the research to confirm it. Nor is it necessarily important, since activities on some Web sites are less significant than others. The value of data from True Influence, or anyone else, can only be resolved through tests, which will probably give different results for different purposes. The mechanics of InsightBASE are straightforward. Users set up a campaign by either uploading their own list of target companies or making selections from True Influence’s own database of more than three million Web domains. Selections can use standard filters such as industry, location, number of employees, or domain type (such as .edu or .gov). They can also be based on use of specific technologies, allowing marketers to target competitors’ customers. The next step is to specify keywords to use as indicators of intent. True Influence has its own list of about 5,000 keywords and uses them to do its own classification of Web pages. It can add new keywords as needed. Finally, InsightBASE runs a report showing how many of the target companies visited pages with the specified keywords over the past thirty days, and whether their activity increased, decreased, or remained the same compared with previous periods. This gives a good indication of the potential volume of future activity. Once the campaign begins, users can extract lists of domains that exceeded a specified activity level or had change in activity. They can export the domains, contacts associated with the domains, or both. InsightBASE has standard integrations with Marketo, Oracle Eloqua, and Salesforce.com. Once the lists are loaded into those systems, they can be used for email, advertising, sales calls, or other purposes. Pricing for InsightBASE is based on the number of domains monitored, starting at $2,500 per month for 2,500 domains with discounts for higher volumes. There are no separate fees for additional campaigns, contact names, or supporting services. True Influence reports that its initial tests showed companies with activity surges responded to promotion emails at four times the rate of non-targeted companies. As you know from previous blog posts, I’ve been borderline obsessed recently with systems that automatically create multi-step campaign flows. So when I saw that OneSpot calls its product a “content sequencing engine” you can bet they had my attention. When I read that “OneSpot’s machine learning technology serially delivers multiple pieces of content to your users based on their interests and digital journey stage,” I thought I might have found the Holy Grail itself. OneSpot was already on my list of interesting companies because they automatically reformat content to use in different channels. This is a good example of applying artificial intelligence to reduce the workload on marketing departments so they can deliver more targeted messages at lower cost. The company had been doing this and programmatic ad buying since its start in 2012. The content sequencing engine is a more recent addition. According to OneSpot Chief Marketing Officer Adam Weinroth, one of the things that make the engine special is that it finds the best content to generate repeat engagement rather than immediate response. Another is that it delivers the content through advertising on external Web sites as well as in email, a company’s own Web site, mobile and social. In other words, OneSpot's “sequencing” is about coordinating messages in different channels, not delivering groups of messages in a fixed order. 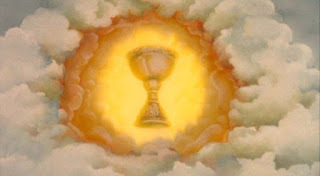 Since my own quest has been automated creation of ordered messages, OneSpot isn't the Grail I seek. But it's still quite special: as Weinroth points out, there are many systems to select offers for ecommerce but few for content marketing. Even fewer support advertising along with other channels. OneSpot deploys several major pieces of technology to make this happen. A content analytics engine automatically classifies existing content without manual tagging. The classification categories (a.k.a. taxonomy) are themselves created automatically. This automation removes one of the largest bottlenecks in deploying high volumes of content. The reformatting engine then prepares the content to be distributed across multiple channels, again without manual labor. The automated recommendations are based on a profile that includes results from all the channels supported by OneSpot. This cross-channel perspective is what lets OneSpot base recommendations on repeat engagement rather than immediate response. It also lets the system bid on advertising to non-customers as well as messages to current customers. OneSpot also has its own real-time bidding engine. It is integrated with major Web ad exchanges, which Weinroth said allows it to potentially bid on 36 million impressions per minute. OneSpot continues to extend its technology. Weinroth showed me a beta version of a report that compares demand for each topic with the number of existing content pieces for that topic and the impact of content with that topic on reengagement. While OneSpot won’t actually create the additional content, this is still another step towards replacing manual tasks with automation. Pricing for OneSpot starts north of $100,000 for an annual contract. The actual fees are based on traffic volumes and channels supported. Weinroth said most clients use the system in at least two channels, typically Web site messages and Web ad retargeting. What began as a whimsical “landscape of landscapes” led to the serious realization that crowd-sourced review sites are the most common type of vendor directory. Fifteen of the 23 sources listed in my original graphic fell into that category. This begged for a deeper look at the review sites to understand how they differ and which, if any, could replace the work of professional reviewers (like me) and software guides (like my VEST report). Since crowd wisdom without a crowd can’t be terribly effective, I limited further analysis to the top 10 sites. Of these, AlternativeTo.net, SocialCompare, and Cloudswave were different enough from the standard model that it made sense to exclude them. This left seven sites worth a closer look. The next question was coverage by the sites of marketing technology. Every site except TrustRadius covered a broad range of business software from accounting to human resources to supply chain as well as CRM and marketing. TrustRadius was more focused on customer-related systems although it still had business intelligence and accounting. The numbers of categories, subcategories, and marketing subcategories all differed widely but didn’t seem terribly significant, apart from SoftwareInsider and DiscoverCloud looking a bit thin. Differences in the numbers of products in the main marketing categories also didn't seem meaningful – although they do illustrate how many products there are, in case anyone needs reminding. What did look interesting was the number of ratings and/or reviews for specific products. I sampled leading marketing automation vendors for different sized companies. It turns out that G2Crowd and TrustRadius had consistently huge leads over the others. I didn’t check similar statistics for other software categories, but this is probably the one that counts for most marketers. Of course, quality matters as well as quantity. In fact, it probably matters more: my primary objection to crowd-sourced software reviews has always been that users’ needs for software are so varied that simple voting based on user satisfaction isn't a useful indication of how a system will for any particular buyer. This is different from things like restaurants, hotels, and plumbers, where most buyers want roughly the same thing. Software review sites address this problem by gathering more detail about both the products and the reviewers. Detailed product information includes separate numeric ratings on topics such as ease of use, value for money, and customer support; detailed ratings on specific features; and open-ended questions about what reviewers liked most and least, how they used the system, and what they’re recommend to others. Reviewer information on all sites except Software Advice starts with verifying that the user is a real person through requiring a LinkedIn log-in. This lets the review site check the reviewer’s name, title, company, and industry, although these are not always fully displayed. Some sites verify that the reviewer actually uses the product. Some provide other background about the reviewer’s activities on the review site and how their work has been rated. I can't show how each vendor handles each of those items without going into excruciating detail. But the following table gives a sense of how much information each site collects. Of course, reviewers don’t necessarily answer all these questions. (Caution: this information is based on a relatively quick scan of each site, so I’ve probably missed some details. If you spot any errors, let me know and I’ll correct them.) When it comes to depth, TrustRadius and DiscoverCloud stand out, although I was also impressed by the feature details and actual pricing information in G2Crowd. The number and depth of reviews are clearly the most important attributes of review sites. But they also differ in other ways. Selection tools to identify suitable vendors are remarkably varied – in fact, the only filter shared by all sites is users' company size. 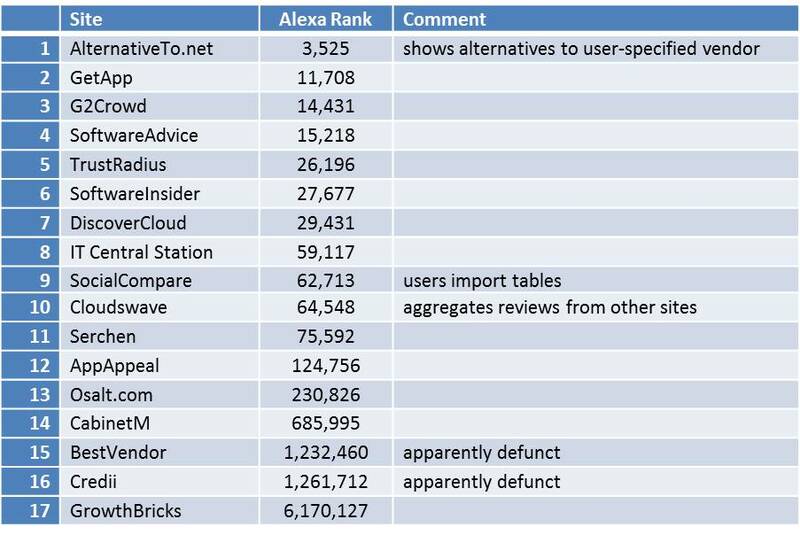 Industry is a close second (missing only in DiscoverCloud), while even selections based on ratings are found in just four of the seven sites. Only three sites let users select based on the presence of specific features, an option I believe is extremely important. Looking beyond selection tools: most sites supplement the reviews with industry reports, buyer guides, comparison grids, and similar information to help users make choices. Several sites let users ask questions to other members. But whether sites can replace professional reviewers is really the wrong question. What matters is the value the review sites offer on their own. I’d say that is considerable: given enough volume, they indicate the rough market share of different products, the types of users who buy each system, and what worked well or poorly for different user types. User comments give a sense of what each writer found important and how they reached their judgements. This in turn lets readers assess whether that reviewer’s needs were similar to their own. Buyers still need to understand their own requirements, but that’s something that no type of review can replace.